I’m always looking for new ways to use what I’ve preserved, especially when it comes to fruit spreads! Cookies made with jam are nothing new for me, but bread-baked preserves were something I’ve yet to try! Preheat oven to 350°F degrees. Grease a loaf pan and set aside. Over medium heat, toast walnuts ’til warm and fragrant, about 2 minutes. Be sure to keep the nuts moving so they do not burn. Set walnuts aside. 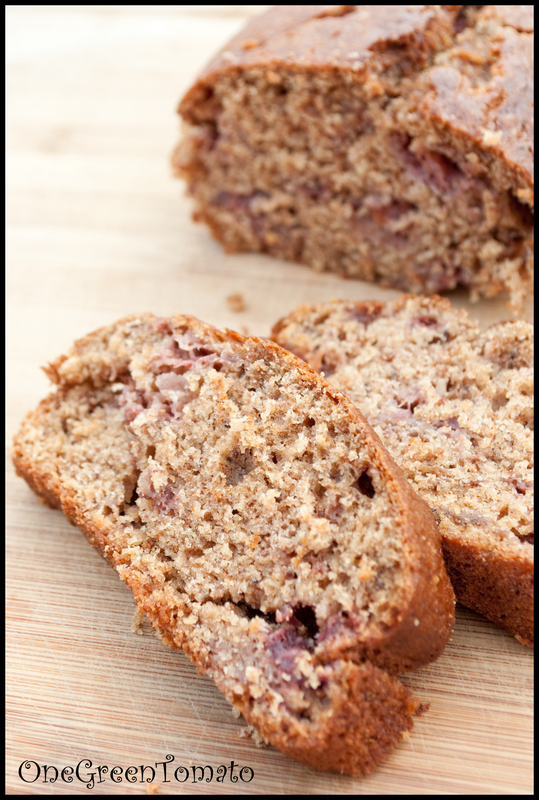 In a large bowl, combine jam, butter, flax egg, maple syrup, and almond extract. Add mashed bananas, stir thoroughly. In a small bowl, sift together both flours, baking soda, baking powder, and salt. Slowly begin adding the dry ingredients to the wet ingredients, mixing well each time. Stir in toasted walnuts. 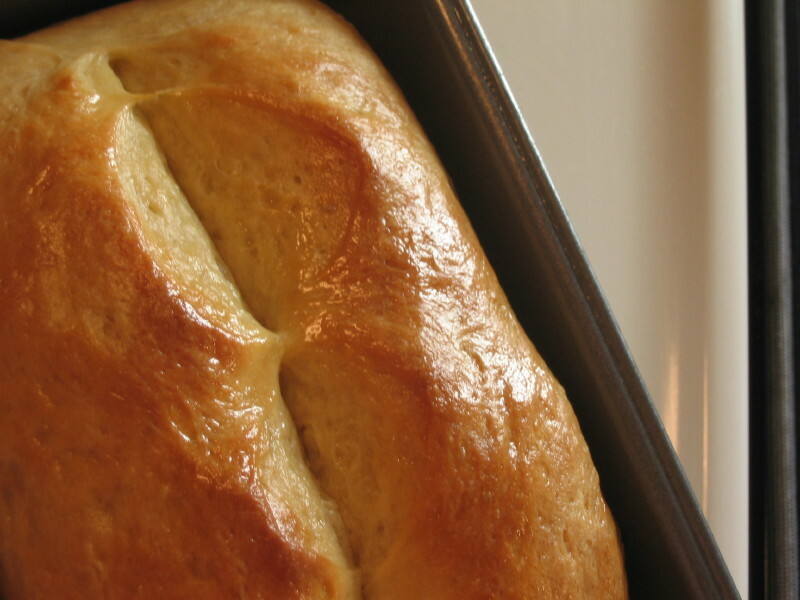 Pour batter into greased loaf pan and bake for 50-55 minutes. 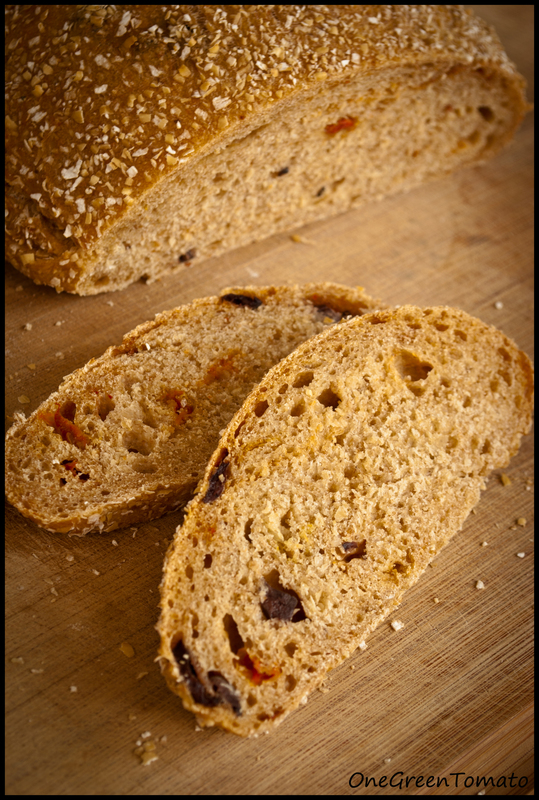 Allow bread to sit for 5 minutes before removing from pan, then transfer to a wire rack to cool completely. Images and content copyright © 2009-2011 Danielle R Limoge. Recipe adapted from Food in Jars. This past May, I spent an evening with my friends, Bill and Lauren; they too share my enthusiasm for all things local, organic, and of course, homegrown! Because I am a passionate advocate for healthy food, low-impact living, and organic gardening, it only seems natural that I end up being the go-to person for related questions and advice. My friends were very interested in starting an organic garden, as well as purchasing their transplants from me. We had decided to make a night of it. I’d bring their plants, my hot artichoke dip, and a fresh-baked apple pie (they were in charge of the main course) and we would share an evening of delicious food and great conversation! And that is exactly what we did. For 4 hours I talked (pretty much non-stop) about food, the food system, and organic gardening. Lauren had a pen and paper at the ready, while her hubby, Bill, absorbed every word I spoke. I’m friends with a lot of like-minded individuals and in our shared idealistic world, we would all be homesteading, off-grid, in our own little community! Ahhhh… the dream! For that evening’s dinner, Lauren grilled California-style veggie sandwiches, which were served on warm-from-the-oven focaccia, paired with a tomato, basil, and mozzarella salad. Everything was delicious! With the back-to-back-to-back, oppressive heat waves that have been taking place, I’ve been relying on my grill for dinner. 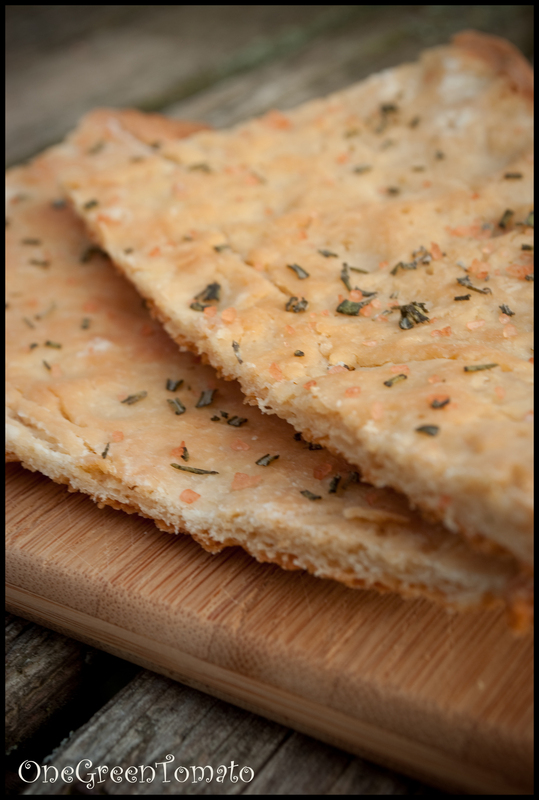 Two weekends ago I baked a double batch of focaccia to be paired with my evening meal of fresh-from-the-garden veggie sandwiches. Sprinkle the yeast over warm water and let stand for 10 minutes. Whisk flour and salt, then drizzle in olive oil until combined with flour. Next, pour in yeast/water mixture and mix until the dough comes together in a sticky mass. Form the dough into a ball and lightly coat with olive oil. Place the dough into a large bowl and cover with plastic wrap, set it aside for 1-2 hours. If you do not plan on using the dough right away it can stay in the fridge for several days. Remove dough from bowl and place on a lightly floured surface. Divide dough in half and roll out into a rectangle. I reserved the second portion to be baked later that week. 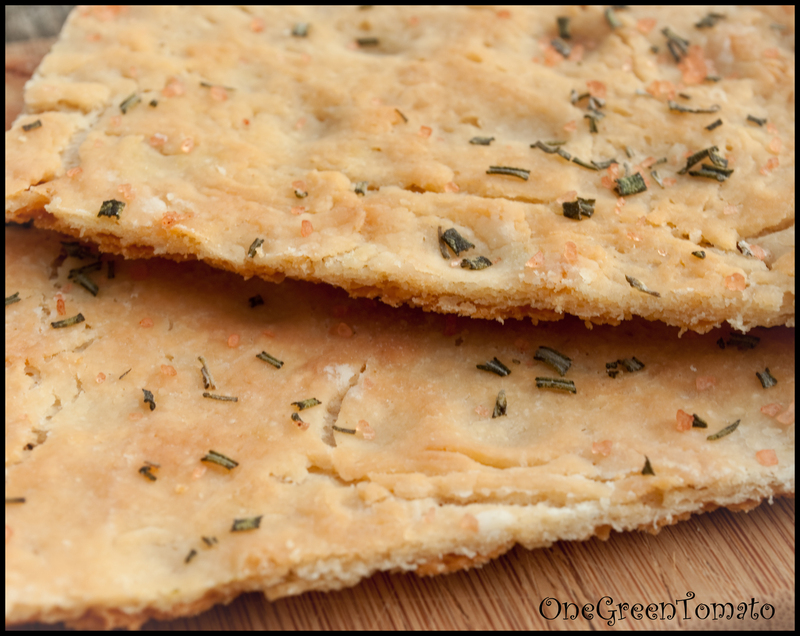 If you are baking both sections, place each one on a separate cookie sheets and lightly drizzle with olive oil. Cover each one with plastic wrap and allow to rise for another hour. Remove the plastic wrap (dough will be puffy) and use your fingertips to gently press dimples into the surface of the dough. Sprinkle with rosemary and coarse salt. I baked each one separately, so 20 minutes was just the right amount of time to yield a golden brown surface. If you are baking both, 30-40 minutes is recommended. Cut into pieces with a pizza wheel. Serve immediately. Since I reserved some of the bread for the next day’s meal, it needed a bit of freshening up. I placed two pieces on the top-level of the grill for 3 minutes and it worked like a charm! I have a confession to make; I suffer from seasonal gluttony disorder, especially when it comes to strawberries! I just can’t help myself, I have to put them in everything. All the time! I’m also guilty of squirreling them away, whether they’re frozen, in assorted jams, or dehydrated! 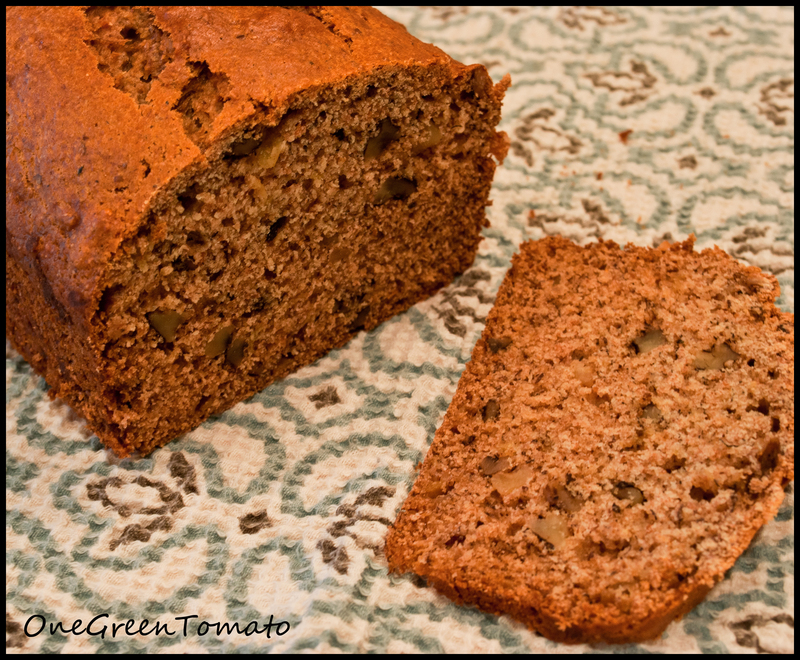 Sunday I noticed I had quite a few over-ripe bananas in my kitchen, so I thought banana nut bread. Then my seasonal gluttony kicked in and I immediately switched gears from bananas to strawberries. I used a basic bread recipe and gave it a complete overhaul; what I ended up with were two very dense, moist, almost dessert-like loaves of bread. Then add a slathering of my strawberry-rhubarb jam and it was dessert!! In a medium bowl, combine strawberries, orange juice, vanilla, and 1/3 C sugar; mix and set aside to allow the strawberries to release their juices. In a large bowl, combine flours, flax meal, oat bran, cinnamon, baking soda, and salt; whisk to incorporate. Make a large well in dry ingredients and add strawberry mixture, oils, apple sauce, eggs, and remaining sugar; stir well, add walnuts, stir again. Pour into two well-greased loaf pans (I use spectrum shortening) and bake in a preheated 350°F oven for 50 minutes or until a toothpick can be inserted into the loaf and comes out clean. 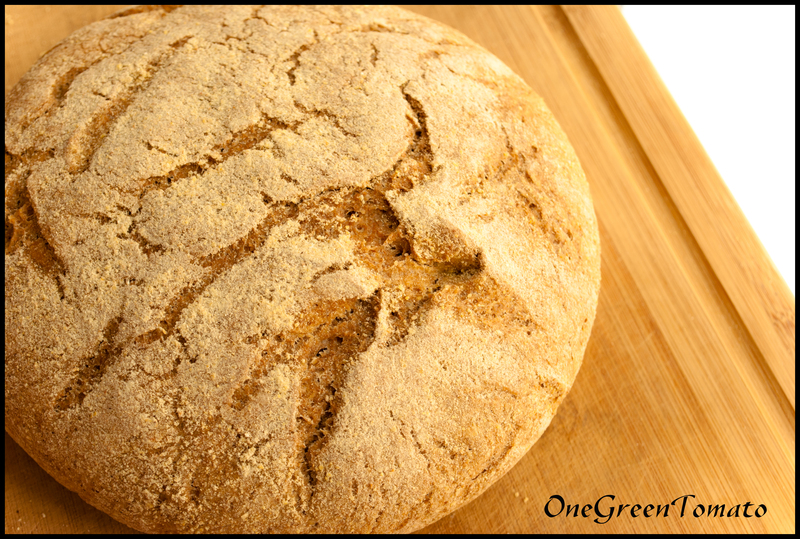 Remove bread from pans and allow to cool on a wire rack. Enjoy!